The National Transportation Safety Board not travel to the scene of this accident. On January 12, 2019, about 1130 central standard time, a Canadair CL-600-2A12, N813WT, owned by a limited liability company and operated by an airline transport pilot, impacted terrain following a runway excursion at the Ox Ranch Airport (01TX), Uvalde, Texas. The captain, first officer flight attendant, and 6 passengers on board were not injured and the airplane sustained substantial damaged. The airplane was operated as a 14 Code of Federal Regulations Part 91 charter flight. 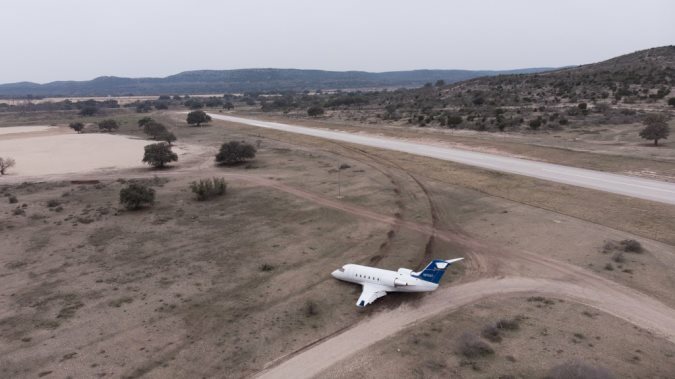 Visual meteorological conditions prevailed and an instrument flight rules flight plan was filed for the cross-country flight that originated at Addison, Texas, and was destined 01TX. A representative for the airport reported that the airplane on landing hit hard and the tire either popped or the landing gear tore off. About two-thirds of the way down runway 35, the airplane slid off the right side of the runway. The airplane proceeded through a ditch and struck a perimeter fence before coming to a stop. The right main and nose landing gear were collapsed and damaged. There was also damage to the right wing, right inboard flap, nose of the airplane, and the vertical stabilizer. At 1155, the weather conditions at Garner Field Airport (UVA), Uvalde, Texas, 24 nautical miles southeast of 01TX was wind 340°at 12 kts., visibility 10 statute miles, clear skies, temperature 63°F, dew point 43°F and altimeter 30.17 inches of Mercury. Kinda of an expensive airplane to be banging the ground like that... one would think it could damage the running gear,........oh yeh it did............. dah........... better luck next time.